WD: What about the increasing audience for art? edition of 25, 12 x 15 in. WD: So there is a discourse between the artist and the public, the culture? WB: Of course there’s an influence. Often emulation tends to be superficial–usually emulation has not to do with the experiences that produced the result but with the appearances of the result. And that’s the problem. There isn’t any way of emulating the experience, because the experience is unique to the person. WD: Tell me more about your experience in making etchings at Crown Point Press. WB: Well, I had done so little printmaking, it was a nearly new experience for me. WD: Didn’t you make some prints in the sixties? WB: I did some lithographs at Tamarind and I also made a few black and white etchings, but I really am a novice at printmaking. The process was comfortable for me, because I had recently been involved in superimposition of images which required predetermination. There is also an advantage in the sequential development of a print, the fact that you have a record of the various phases. WD: It can be tough to separate the various elements, if you’re not used to working that way. When you are working at color etching, you have different plates, and you have to think about how they work together. WB: But for me it wasn’t separate from my recent work. Had I undertaken printmaking, let’s say, ten or twelve years ago, it would have required a greater change of process for me. Of course, the intaglio medium is entirely different. WD: And, working with other people is very different. WB: Yes, and I tend to work solitarily. And, so that’s a whole different thing. I think of printmaking as collaborative. It is true that the artist has a responsibility for the image, the work, but the influence of the interaction with the printers is very great. WD: But the decision-making really stays with the artist. WB: It stays with the artist, but it is collaborative, because the printer must be in rapport with an artist’s inclination, to make known to the artist who hasn’t had a wide experience in printmaking, the possibilities of the process. In any new medium, one must learn a language. You’ve heard people say, well yes, they speak French, but they still think in English. And photographers don’t just see what’s out there, they see the photograph through the lens. They know what they are reaching for, and without that kind of experience, I think you are still translating, in a way. I love painting, but I’ve always had an involvement with line, and the quality of line in etching is unique. WD: Etching can be somewhere between painting and drawing. WB: Well, etching, in a sense, is akin to painting. One could think that drawing is like chamber music, which is complex and yet limited to a few instruments. Painting, perhaps, is more akin to symphonic music. Well, I think color etching tends toward the symphonic. 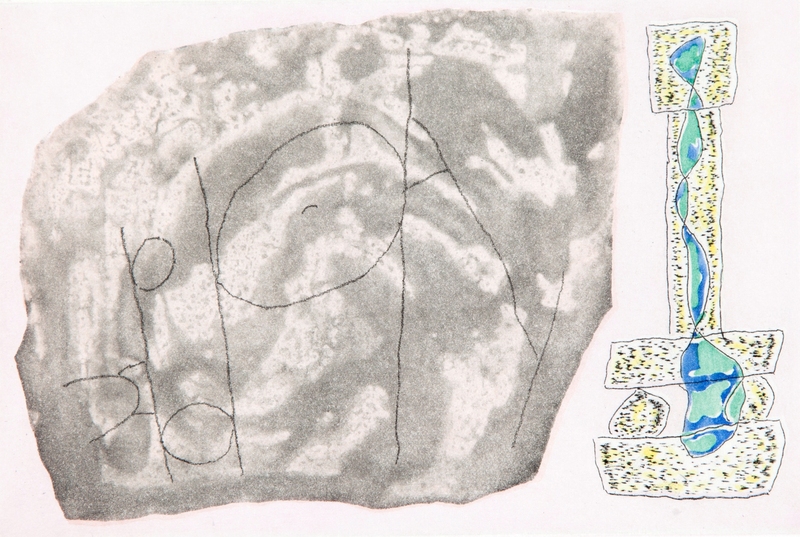 Untitled #5 (Ivory Field), 1985, Color aquatint etching, edition of 25, 29 3/4 x 44 in. WD: Yes, yes, it does. The subject matter in your recent etchings has loosely to do with male and female figures. I was thinking about the figurative paintings that you were doing in the sixties. If I am not mistaken, you concentrated on the female figure. However, often there were couples or two figures and they were very evocative. 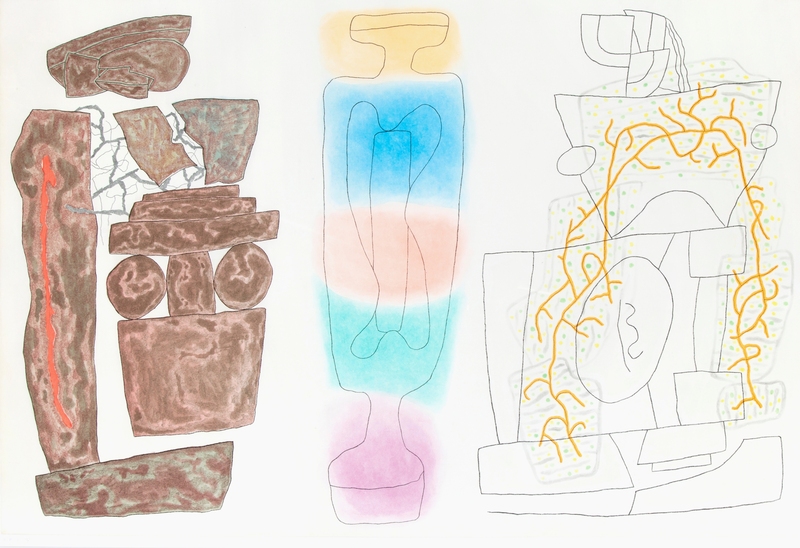 Now the figures are more abstract, archaic and rock-like, but I see connections to your earlier work, even though now it is more abstract. WB: Yes, there are connections that I have recognized, after the fact, certain inclinations, unconscious and continuing. We appreciate the artist’s power to see the world imaginatively, but artist’s imaginative ability to see the implications within their work is no less significant. I am thinking, for instance, of the evolution of Picasso’s work. I think the multiple views of the head emerged as a recognition of possibility, an implication he found in his work rather than an idea imposed. 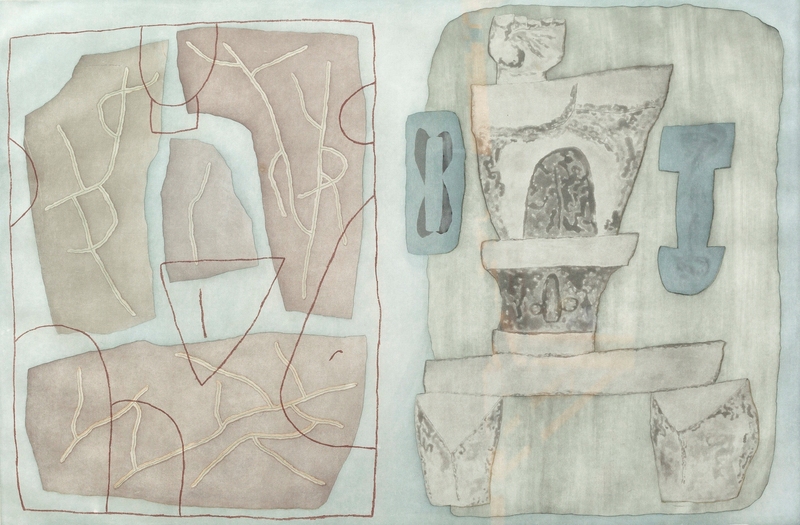 Untitled #6 (Grey Field), 1985, Color aquatint etching, edition of 25, 30 3/4 x 44 in. WD: Do you still draw from the live model? WB: I still do. It is a renewal of experience. There was a time when I did a lot of drawing directly from the figure, and increasingly I found that in the presence of the model I tended to respond to all that was present. Gradually, I found what, in any given instance, was of particular significance to me. At that time it was rare that in the presence of the model I made a drawing that satisfied me expressively. I had to be away and find what was residual, what I couldn’t let go of.